They are the noisemakers you heard constantly during last summer's World Cup tournament, but you won't be hearing any vuvuzelas at the Harvard-Yale football game this weekend. The Ivy League's biggest football game of the year happens this weekend. Leading up it, the noisemakers had become commonplace on Harvard's campus but school administrators ordered a last-minute ban, according to the Harvard Crimson. "In keeping with Department of Athletics' commitment to conduct athletic contests in a manner that promotes good sportsmanship, artificial noisemakers will not be permitted inside the ticketed footprint of Harvard Stadium," Associate Director of Athletics Timothy Wheaton wrote in a statement on Thursday, the New York Daily News reports. The ban comes after students introduced the Silence Yale campaign two weeks ago. 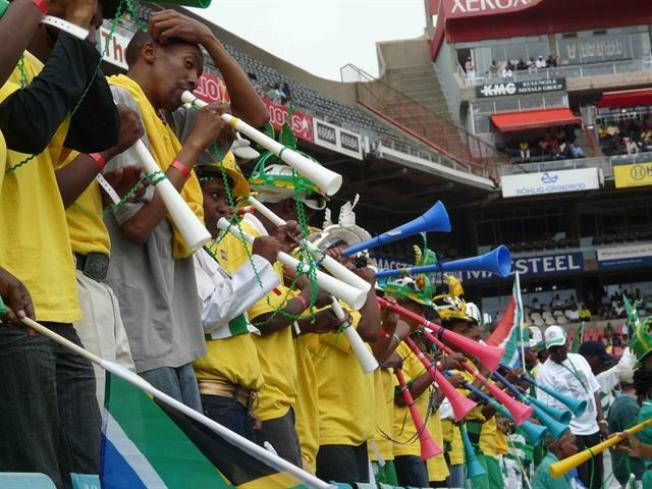 Two undergrads were planning to distribute the vuvuzelas before the game, the News reports. The battle is on on the Silence Yale Campaign on Facebook. "We all know what Yale sounds like: failure. During the upcoming game, Cambridge cannot afford to endure the noise pollution produced by so many whining Harvard rejects," the campaign said on its Facebook page. Not to be outdone by their rivals, Yale students responded with a campaign of their own and sold more than 300 vuvuzelas with the words "Harvard Blows" printed on them, the New York Daily News reports. Despite initial support for the noisemakers, Crimson fans weren't sold on the idea. Last week, students on the school's Undergraduate Council passed legislation recommending the ban, Harvard's student newspaper The Crimson, reported. For the Harvard students who introduced the bill, it all came down to making sure their team had every advantage to beat their rival. "If you're on offense, you can't hear your own team," said Spenser Goodman, who introduced the vote according to The Crimson. Harvard football player Nicolai Schwarzkopf agreed, telling the paper, "We definitely have other parts of the game that people want to hear besides a loud unbearable humming." That point is apparently something both Yale and Harvard's teams can agree on. "If soccer players are complaining about the noise, I'm sure football players will, too," Yale quarterback Patrick Witt told the Yale newspaper. "As quarterback, if I can't communicate in the line of scrimmage, the game won't take off." Yale and Harvard face off this Saturday for the 127th time in the rivalry.